application only accepted for this Delhi Police MTS Cook, Safai Karmachari Vacancies. Last date for submission of application form online @delhipolicerecruitment.in website is 16-01-2018. Candidates who are qualified 10th class or ITI in relevant field they can apply online for this Delhi Police MTS Cook, Safai Karmachari jobs. Candidates selection for this Delhi Police MTS Cook jobs will be held through written exam and Trade test. 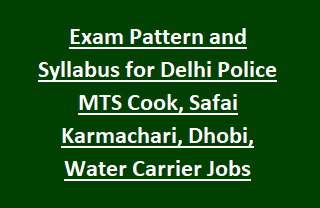 In this Delhi Police MTS Cook recruitment article we are providing the Exam Pattern and Syllabus, Exam dates, admit Card, result, selection process related information. Candidates will be selected in different stages. Written exam will be objective type only. Probably written exam will be conducted for 100 marks. Exam pattern will be in four subjects. Admit Card for written exam will be available 10 days before the exam date. Candidates who are qualified Written exam they are only eligible for attending the trade test. Trade test will be their respective trade related only. For Cook post cooking test will be conducted. For barber post their related work will be given. Candidates who qualified trade tests they will be called for documents verification. Candidates must have submit all original documents for verification. Sometimes documents verification will be held at the time of Trade Test itself. For more details refer official website of Delhi Police @delhipolicerecruitment.in. Final Merit List will be prepared based on above test and those candidates have to undergo for medical test as per Delhi Police norms.